Go paperless with DocuSign. DEVTAC provides our clients with digital signature to benefit and automate their signatures for business transactions. Electronic Signature as defined by the US Federal ESIGN Act is an electronic sound, symbol, or process, attached to or logically associated with a contract or other record and executed or adopted by a person with the intent to sign the document. Avoid the hassle of physically sending documents for signature with Devtac DocuSign. 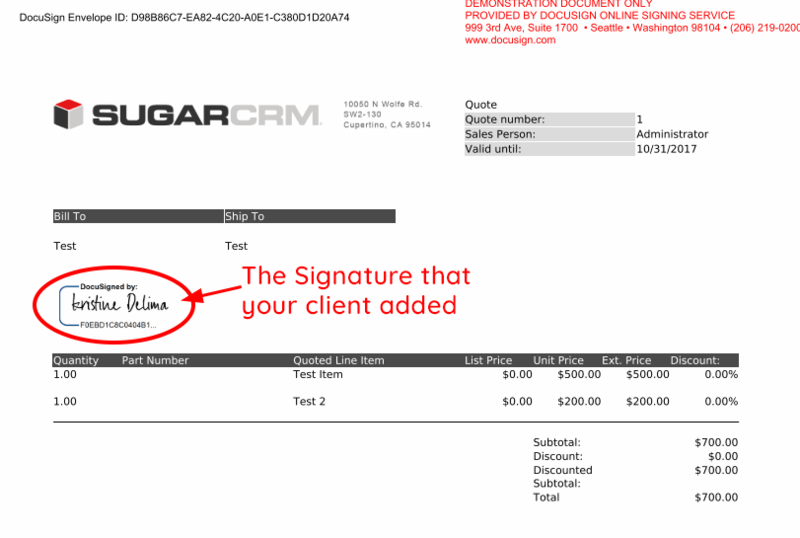 This plugin, integrated into the SugarCRM platform, allows you to upload and send multiple documents and PDFs, from your own Sugar to your customers for signature. Step 2. Choose an available quote that you’d like to be signed or click Create to make a new document. Step 3. Inside the Document’s page, click Edit and then click Open in DocuSign. You have the option to either choose an Invoice PDF or Quote PDF to be signed. Step 6. Your client will receive the document that needs to be signed via email. Click Review Document and he will be routed to the DocuSign website. He will then add his signature on the signature box and click Finish (located on the upper right hand of the document). He’ll have the option to download a PDF copy or close the document.